Demand for biodegradable plastics is continuing to build up, with plant-based and organic materials being utilised to develop environmentally-friendly plastics, says Angelica Buan in this report. 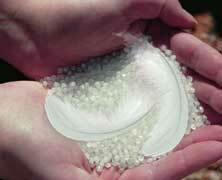 The plastics industry has been reinvented to allow for biobased materials as well as post-consumer recyclates. A more environmentally-friendly breed, biodegradable plastics are poised to cap US$21 billion by 2025, increasing from almost US$4 billion in 2016 at a CAGR of 20.8% during the period, citing a report by Coherent Market Insights. Biodegradable plastics are derived from various agricultural products such as starch, cellulose, proteins, and plant oil. The largest bulk of requirement for biodegradable plastic by application is packaging, accounting for more than half of the total market share or 60%. Europe is the material’s largest consumer, owing to the region’s strict regulations on oil-based plastics. It is followed by the US and the Asia Pacific region, with China, India, and the ASEAN countries attributing to the robust growth. A bonanza of initiatives is taking the development of biobased materials to new heights. An EU-funded consortium, Karma2020, is creating a novel twist to discarded poultry feathers and turning them into highly valuable plastic materials. According to the European Commission (EC), feathers from 1 million tonnes of poultry produced in Europe are wasted, with a majority of the feathers that are recycled “converted into low nutritional value animal food or disposed in landfills, causing environmental and health hazards”. Thus, the EUR6.7 billion Karma2020 project aims to develop underutilised waste to create value-added raw materials for the chemical sector such as keratin, bioplastics, flame retardant coatings, non-woven and thermoset biobased resins. The consortium is formed with 16 partners from ten countries, including Grupo Sada (Spain), Teknologian tutkimuskeskus VTT Oy (Finland), Rise Research Institute of Sweden, Centre Scientifique & Technique de L'Industrie Textile Belge (Belgium), Institute of biopolymers and chemical fibres (Poland), Sioen Industries (Belgium), Centre National de la Recherche Scientifique CNRS (France) and Avantium Chemicals (the Netherlands). Others include FKUR Kunststoff (Germany), Fertiberia (Spain), Vertech Group (France), Ciaotech (Italy), Daren Laborator ies & Scientific Consultants (Israel), Rise Processum (Sweden) as well as Spain’s AIMPLAS. The raw materials derived from the valorisation technology will be manufactured on an industrial scale and used for the production of biobased products, such as slow release fertilisers, biodegradable food packaging plastics, flame retardant coated textiles, and flame retardant thermoset biobased composites. Agricultural waste like rice straws, corn, potato, seeds, husks, grasses and other starchy and sugary crops converted into biomass are not new. 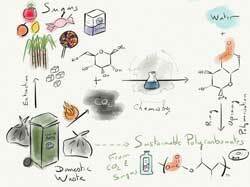 A chemical that is often associated with biodegradable materials is polylactic acid (PLA), generally produced from plantbased feedstock such as corn or sugar-cane. Of biodegradable materials, PLA has the largest market share by volume, owing to its easy processability and superior mechanical strength. Research firm Persistence Market Research (PMR) attributes the growth of PLA to the popularity of ecofriendly products and the campaign for pollution control. Compostable PLA has a huge market for applications in the food and beverage and consumer goods packaging, automobiles, agriculture, electronics and textiles sectors. Packaging is usually imputed to PLA, but currently the thermoplastic is also making headway in other industries. PLA is unleashed in the world’s first of its kind composite car developed by students from the Netherland’s Eindhoven University of Technology (TU/e). The electric car, called Lina, has a chassis, which is a combination of fibreglass-like biocomposite, and bioplastic. “For the honeycomb structure, PLA is used as the core material and is manufactured entirely from sugar beet. It is enveloped in bio-composite sheets that have been composed from flax, a plant that is also grown in the Netherlands,” the team explained. Lina’s bodywork is also flax-based and interior is made of natural materials. 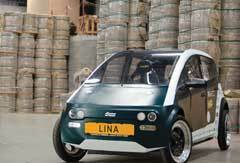 The TU/e team described Lina as an energy-efficient car that weighs in at 300 kg. The four-people-capacity city car has been certified roadworthy by the Netherlands Vehicle Authority. Other features of Lina include a redesigned battery pack from Nova, another biocomposite concept car unveiled in 2015; and the NFC tags in doors, enabling users to unlock Lina with a smartphone. Meanwhile, TU/e also partnered with four other Dutch technology universities namely, TU Delft, University of Twente, and University of Wageningen, to build a sensor-filled footbridge in Eindhoven. 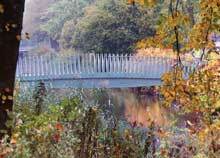 The 14-m long biobridge, unveiled in late 2016, is made of hemp and flax fibres. According to the initiators, the hemp and flax were stuck together to a PLA foam core and then a bioresin was sucked into the fibre layers using a vacuum, which produced a very strong girder when hardened. They reasoned that using a biocomposi te in a construction project will reduce dependence on oilbased resources, which is the objective of a circular economy where products and resources are reused. Seaweed and water definitely go hand-in-hand with this innovation by UK-based Skipping Rock Labs. The seaweed-based water pouch looks like a blob that is both biodegradable and edible. Targeting to ease the use of plastic bottles, the gelatine membrane called “Ooho!” is made of sodium alginate from seaweed and calcium chloride, so it is 100% seaweed/plant-based. It biodegrades in 4-6 weeks, just like a piece of fruit; and has a shelf-life of a few days, thus ensuring that the product is fresh. Not only is the production cost per capsule cheap (about US$0.02 cents, according to the initiators), but it also emits five times less carbon dioxide and expends nine times less energy than regular PET bottles. 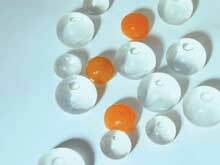 The edible product is also versatile – flavouring can be added into it; and it is not limited to containing only plain water. The soft, yet, sturdy packaging can also be used for soft drinks, spirits and cosmetics. Skipping Rocks Lab is part of the Climate KIC startup acceleration programme founded by the European Institute of Innovation & Technology (EIT) and the scientific team is based in Imperial College in London, UK. Biodegradable plastics find their niche in the agriculture sector with mulch films, a market that is, based on India-headquartered Market Research Future (MRFR), projected to exceed US$13 billion by 2022, given the shrinking arable land vis-à-vis rising population, and policies favouring the use of biobased products. Nevertheless, growth of the mulch films market is saddled by high initial costs, MRFR cited. Adding more to the cost is the use of machines to prepare the soil for applying the films. Aiding the growth trajectory of biodgredable films are regulatory frameworks such as that of the European Parliament’s Committee on Internal Market and Consumer Protection (IMCO), which has recently amended the EC’s proposal for a revision of the Fertilisers Regulation. In doing this, the IMCO Committee acknowledges the potential of biodegradable mulch films, which it says help avoid the generation of microplastics on fields. Meanwhile, Germany-based industry association European Bioplastics (EUBP) said it is backing this support as well as the opinion-giving expert Committees on Agriculture and Rural Development (AGRI) and on the Environment, Public Health and Food Safety (ENVI). “Biodegradable mulches deliver positive agronomical effects such as increasing yield, improving quality of crops, weed control, and reduction of water irrigation and pesticides. Moreover, they offer distinctive advantages at the end of the crop cycle as they can be left on the field and ploughed under, which significantly reduces the agricultural plastic waste and potential soil pollution,” said EUBP. EUBP has said the inclusion of biodegradable mulches in the Fertilisers Regulation “will help to harmonise regulations across the EU member states”, adding that the standard is expected to be published by the end of the year and will include complete biodegradation within 24 months as well as an eco-toxicity test. It is befitting for environmental awareness to start from home. Hence, biodegradable household products are basic implements to raising the sentience for the environment. Take i t from Funguschain, a European project that transforms mushroom waste from commercial farming into bioplastics. Funguschain is a consortium coordinated by Netherlands-based BioDetect ion Systems (BDS), which consists of 16 partners from ten different European countries, including research institutes and 12 companies that are leaders in biobased economies. 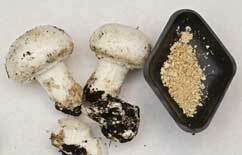 The EUR8 million project, funded by the Biobased Industries Joint Undertaking under the EU’s Horizon 2020 research and innovation programme, aims at revalor ising 65% of agrowastes f rom mushroom farming residues to extract biobased additives, including antioxidants, antimicrobials and proteins. It also aims to convert lipids into bioplasticisers and polysaccharides - glucans and fermentable sugars - into biopolymers using the remaining side streams in substrates to close the agricultural cycle by composting and/or biogas synthesis. The project is expected to process Europe’s volume of mushroom wastes, which runs to 60,000 tonnes/week, into valuable additives that can be applied to a broad range of end-user products like household cleaning products, food supplements, biobased thermoplastic masterbatches, bioplasticisers and industrial film products (thin bags and gloves less than 15 microns, partially recycled thick bags more than 50 microns and mulching films). Soy is the focus of an innovation by experts at Spain’s University of Seville and the University of Huelva. The team has obtained a natural bioplastic from soy protein that is capable of absorbing water up to 40 times its own weight; and suited as an alternative for synthetic polymer-made plastics used in hygiene and sanitary products. The team modified soy, which is inherently capable of absorption, to enable it to retain a higher percentage of water, thus classing it as a super-absorbent bioplastic. After extracting protein from soy, the solid compounds are dehydrated using freeze drying, a method that is less aggressive than atomisation and thereby has practically no effect on the protein. The modified isolated compound of the protein is mixed with a plasticiser. In the near future, other crops like cotton will also be explored as a source of super absorbent materials for sanitary and agro-industrial applications, say the researchers. Meanwhile, UK’s University of Bath scientists have created a biodegradable polycarbonate (PC) by adding the sugar found in DNA, called thymidine, as a building block, and carbon dioxide, at room temperature and under low pressure conditions. PC is used to make drinks bottles, lenses for glasses and in scratch-resistant coatings for phones, CDs and DVDs. Current manufacture processes for PC use BPA (banned from use in baby bottles) and highly toxic phosgene, used as a chemical weapon in World War One. Bath scientists have made alternative PCs from sugars and carbon dioxide in a new process that also uses low pressures and room temperature, making it cheaper and safer to produce. The resulting plastic has similar physical properties to those derived from petrochemicals, being strong, transparent and scratch-resistant. The crucial difference is that it can be degraded back into carbon dioxide and sugar using the enzymes found in soil bacteria. It is also bio-compatible so could in the future be used for medical implants or as scaffolds for growing replacement organs for transplant. PhD student and first author of the articles in the journals Polymer Chemistry and Macromolecules, Georgina Gregory, explained: “Thymidine is one of the units that makes up DNA. Because it is already present in the body, it means this plastic will be bio-compatible and can be used safely for tissue engineer ing applications. “The properties of this new plastic can be finetuned by tweaking the chemical structure – for example we can make the plastic positively charged so that cells can stick to it, making it useful as a scaffold for tissue engineering.” Such tissue engineering work has already started in collaboration with Dr Ram Sharma from Chemical Engineering, also part of Bath’s Centre for Sustainable Chemical Technologies (CSCT). The researchers have also looked at using other sugars such as ribose and mannose.